Bionova NPK 12-8-11 contains 12 % N (nitrogen) of which 1 % is NO3 and 11 % NH2. Furthermore, the product contains 8 % P2O5 (phosphor); 11 % K2O (potassium); MgO (magnesium) and a number of trace elements such as iron, boron manganese, molybdenum and copper. 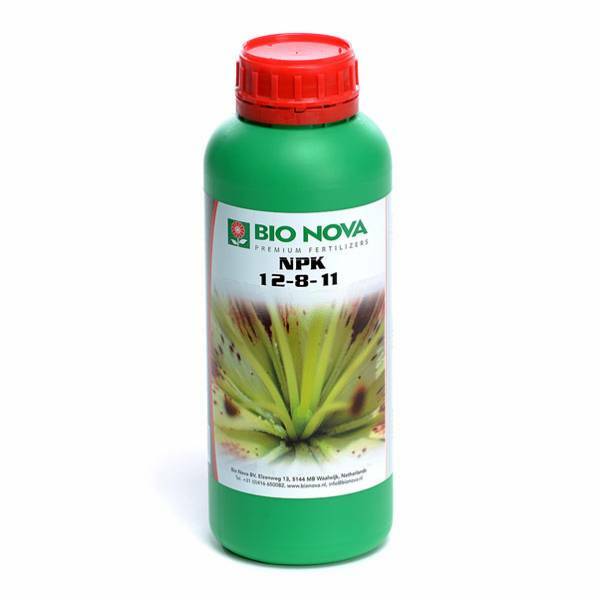 Besides the single N, P, and K fertilizers BIO NOVA also offers a complete N-P-K combination in the ideal proportions of NPK 12-8-11. This combination is especially qualified for soil and hydro-cultivations and makes for an ideal combination with other mineral fertilizers and trace elements. NPK 12-8-11 is very economic. NPK 12-8-11 does not contain any excess ingredients and works very rapidly. Depending on the used combinations the dosage should be 100-300 ml. per 100 litres of water. A dosage of 1:1000 increases the total amount of N by 9.5 mmol; the amount of P by 1.4 mmol and the amount of K by 3 mmol.